A few weeks ago myself and Nicola were invited to review Castlehill Restaurant in Dundee where Chef Graham Campbell has been wowing diners for the last year. We had seen Graham represent Scotland on last year's Great British Menu and had been impressed with his cooking style and passion for local produce. As I had a birthday weekend coming up, we decide to make the trip up the M9 to the east coast and celebrate my birthday in style. From the outside the restaurant looks fairly compact with bar dominating the entrance area and a few tables lined up against the right hand wall but the tables wind round the corner to a larger dining area. Dark wood and blood red leather dominate the dining area giving the impression of a classy establishment, good quality cutlery and linen napkins also let you know that you're in for a fine dining experience. 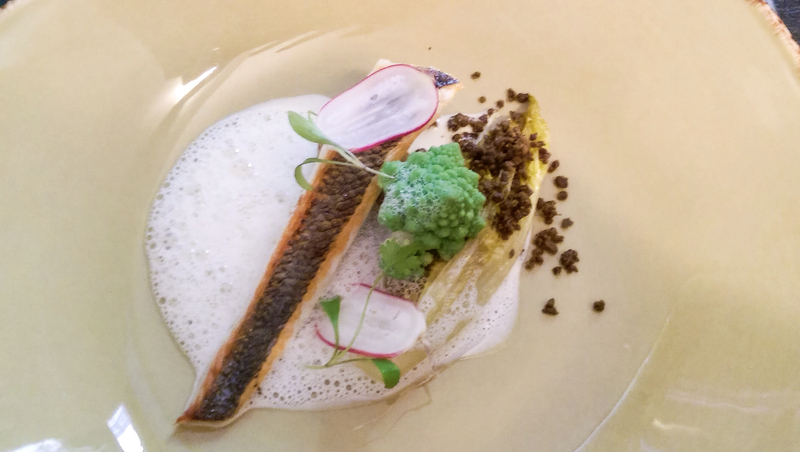 The lunch menu offers a great value two courses for just £14 or three courses for £18 but as we were celebrating a special occasion, we decided to go for the tasting menu which is charged at a very reasonable £32. In fairness, if we were in Edinburgh or any other big city, the cost of the tasting menu could easily have been closer to the £50 mark. Normally we would have taken the restaurant up on their matched wines option but as I was driving (and we had another tasting menu ahead of us later that night), Nicola decide to try a couple of glasses of a wonderful rosé Rioja at £6 per glass. 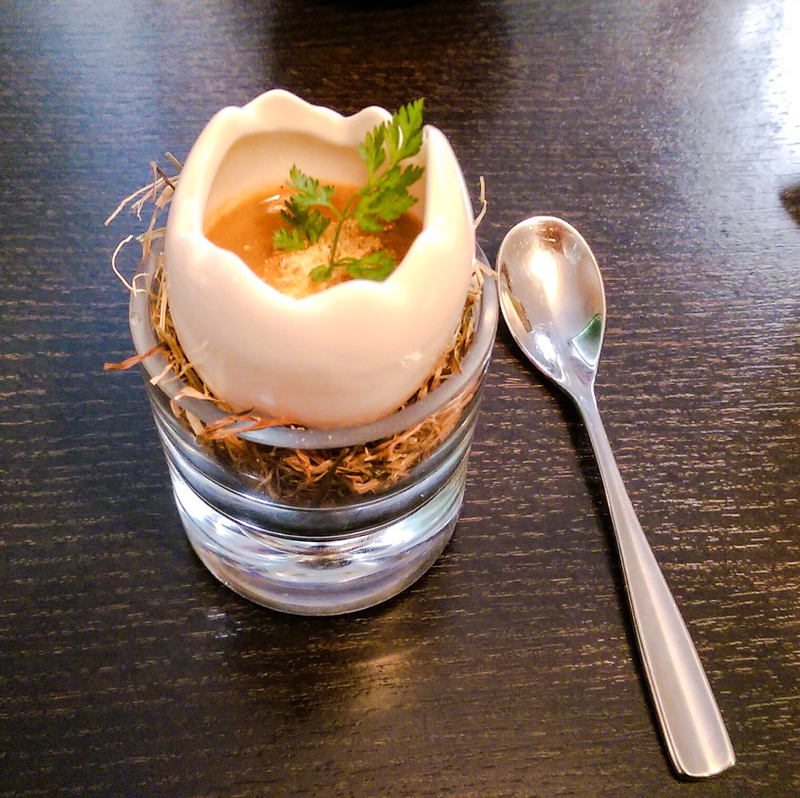 After being served home made olive bread with creamy butter, we were treated to the first dish of the tasting menu as we were presented the Chef's Amuse of a luxurious lobster bisque with crème fraîche and baby coriander leaf served in the cutest porcelain eggshell on a bed of hay. It might have been a small portion but it wasn't small in flavour - we could easily have eaten a bowl of the bisque for lunch and have been happy with just that! We both loved the little eggshells and still can't believe that we didn't steal them when we were finished. 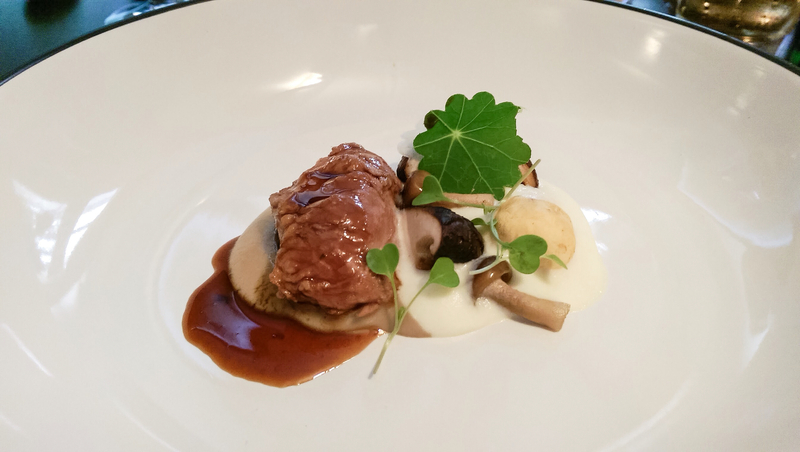 Next up was pork cheek with celeriac purée, mushrooms and tarragon - a truly accomplished dish. The pork cheek was unbelievably tender, falling apart at the slightest resistance from the fork, with a huge rich flavour which was more reminiscent to beef than pork although that could have been partly down to the super rich jus that was served over the cheek. The celeriac purée was smooth and cream, the flavour of celery was clear to the taste balanced by the earthy mushrooms and sweet aniseed and vanilla notes from the tarragon. This definitely ranks as one of the best plates of food that I've been lucky enough to have eaten this year. With the meat dish gone, we moved onto the fish course which was sea bream, baby gem, olive and scallop velouté. 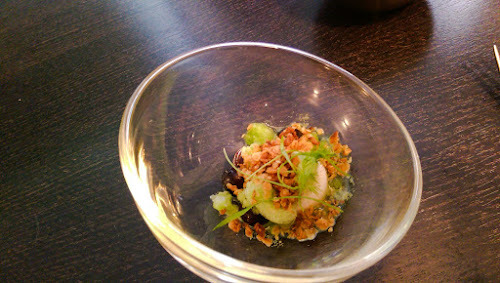 This was another dish that grabbed the attention of the taste buds with flavour and texture. 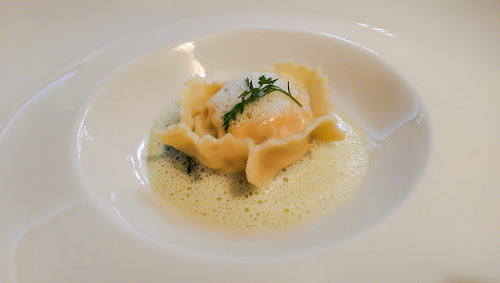 The seam bream was pan-fried to perfection with soft flakes of fish atop the crispiest skin - the saltiness from the sea was balanced with the sweetness from the scallop velouté. The fish was served on top of a braised half baby gem lettuce which had been wilted just enough that it still held its shape. A wonderful olive crumb helped add a further depth of flavour, the earthy and salty crumb scattered around the plate whilst blanched Romanesco brocolli and pickled radish rounded the dish of perfectly. I loved the use of the braised baby gem as a vega tenable rather than a salad leaf and look forward to trying this style of cooking at home. 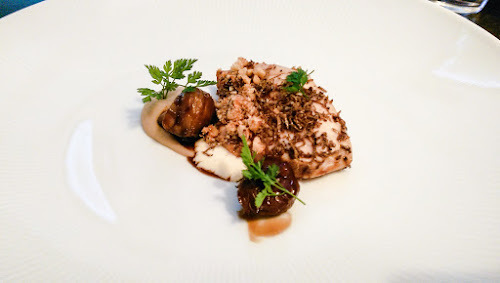 I wasn't sure that Chef Graham could impress us any more than he had already but when the game course arrived, along with a little drama, we were once again wowed by big flavour and great cooking skill. The partridge dish with chestnut, truffle custard and consommé isn't something that I would have normally ordered from a menu but aft this dish, I would have to reconsider! 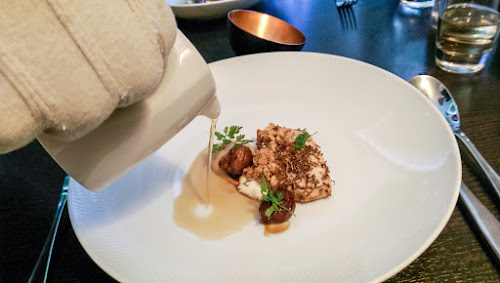 Even before the consommé was poured around the plate, the aromas coming from plate were intoxicating and we couldn't wait to dive in. The partridge breast was tender and moist, with a taste that was more like good old roast chicken from when we were kids. The truffle custard was really a rich mashed potato, infused with truffle oil whic worked incredibly well with the sweet chestnuts and partridge. The flavour was cranked up a notch by the addition of grated truffle over the top of the partridge breast before our waiter lifted the flavour once more by pouring the most intense mushroom flavoured consommé around the dish. Together, everything was absolutely delicious! After such rich food, it's quite normal for a palette cleansing sorbet to be served before the final pudding but Chef Graham likes to push the boundaries and the Chef's pre-dessert certainly raised an eyebrow or two. The tarragon sorbet with frozen yogurt, pickled blueberries and toasted oats might not have be to everyone's taste but the contrast between aniseed from the tarragon, the sharp creamy yogurt and the sweet pickled blueberries seemed to work incredibly well whilst the buttery toasted oats added a great balance of crunchy texture. The last course of the day was simply titled - Dark Chocolate, Mint, Crème Fraîche & Crumb - but there was nothing simple about the dessert that arrived at our table. 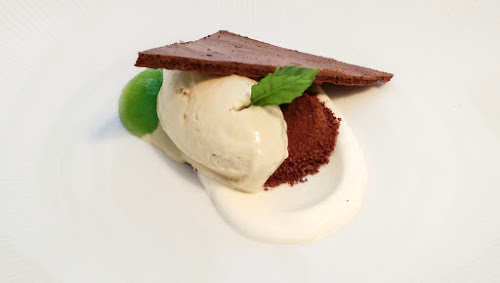 Buttery crumbed biscuit which was rich with dark chocolate flavour sat under a scoop of creamy mint flavoured ice-cream (possibly the best ice-cream that I've ever eaten) whilst a triangle of dehydrated chocolate brownie added a nice crunchy to the dish. The brownie was slightly bitter which worked well with the sweet mint coulis that accompanied the dish. This adult oriented mint choc chip icream dessert is definitely one of the best puddings that I've tasted. With dessert finished and the busy lunch service almost over, Chef Graham came out to have a chat with us, keen to know what we thought of the tasting menu. 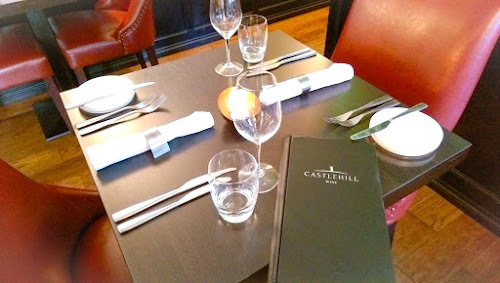 I can honestly say that our lunch at Castehill Restaurant was outstanding and right up there with some of the wonderful Michelin meals that we've had in London. I can understand why the Michelin inspectors rated Graham so highly in the past (Graham was the youngest Scottish chef to receive a star when he was working at Ballachullish House in Fort William), and if the gossip is to be believed, they are looking very closely at Castlehill Restaurant as a contender for Dundee's first Michelin starred restaurant, so watch this space! I would also point out that the service from all of the waiting staff was fantastic. Everyone seemed to know their role and they clearly worked well as a team - something that other restaurants could learn from. We would like to thank Graham and his team for their hospitality and generosity and say that although our food was complimentary, the review above is an honest report on our experiences at Castlehill Restaurant. 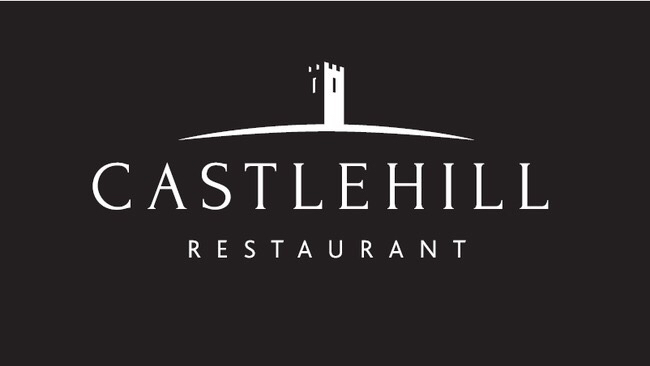 So if you're looking for great food, fantastic value and service that makes you feel Castlehill Restaurant will not disappoint. Keep up to date with news from Castlehill Restaurant on Facebook and Twitter and if want to know more about Chef Graham Campbell, check out his answers to my 5 Questions.